Objectives: Students will learn about living and working onboard the International Space Station through reading a NASA press release and viewing a NASA eClips video segment. Then students will use the volume formulas for spheres, cylinders and cones to measure the capacity of objects within the ISS to apply what they have learned. Common Core ELA for Science: RST.6-8.2. Determine the central ideas or conclusions of a text; provide an accurate summary of the text distinct from prior knowledge or opinions.RST.6-8.8. Distinguish among facts, reasoned judgment based on research findings, and speculation in a text. RST.6-8.9. Compare and contrast the information gained from experiments, simulations, video, or multimedia sources with that gained from reading a text on the same topic. Common Core Math Standard: CCSS.8.G.C.9 Know the formulas for the volumes of cones, cylinders, and spheres and use them to solve real-world and mathematical problems. The thought of long-duration space exploration may bring to mind scenes from the 1968 science-fiction movie “2001: A Space Odyssey.” In the film, a giant centrifuge creates artificial gravity and provides Earth-like conditions for crew members—simplifying daily tasks like working, eating and sleeping and allowing the human body to maintain a similar physiological state as it would on the ground. As thrilling innovations such as this may someday surface in the future, ensuring the health of crew members today is a critical component of long-duration spaceflight. To further the current knowledge base and address the inherent risks, NASA plans to take an inward look at long-term human physiological responses to spaceflight. 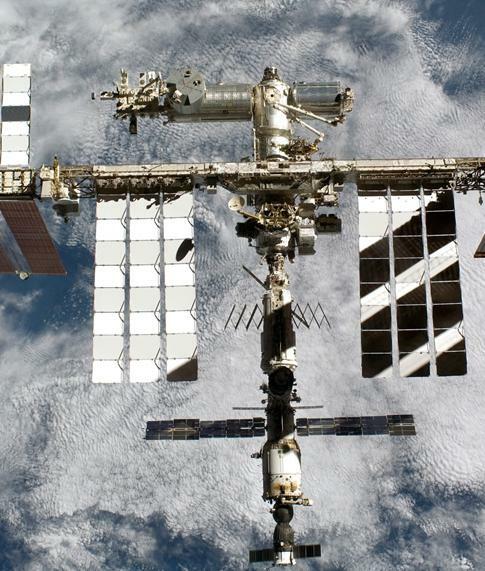 NASA and the Russian Federal Space Agency (Roscosmos) recently announced an agreement to send two crew members to the space station on a one-year mission. The other partners in the International Space Station Program also will work to ensure the success of this mission. The valuable scientific data collected will help send humans to new destinations, supporting the next generation of space exploration. Typical physiological responses of long-duration spaceflight include increased bone and muscle loss and decreased cardiovascular function and sensory motor performance. Data from the year-long expedition will provide information about crew performance and health, and aid in the reduction of certain human health risks associated with future exploration. Write your own problem - Using information found in the Math Connection problems, the press release or the video program, create your own math problem. Explain why you set the problem up this way, and how you might find its answer.